Ram 3500 pickup trucks include special RAMBox cargo management systems that secure merchandise inside the truck and also in the bed. The specialized Cargo View camera gives drivers convenient views of their truck beds and all of their contents at the push of a button. 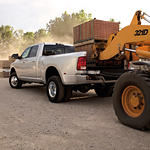 The 2019 Ram 3500 also makes it easy for drivers to safely back up their vehicles. Since trucks like the 3500 are large, bulky, and often contain vision disrupting cargo, the Parkview rear backup system provides a critical safety valve for cautious drivers.